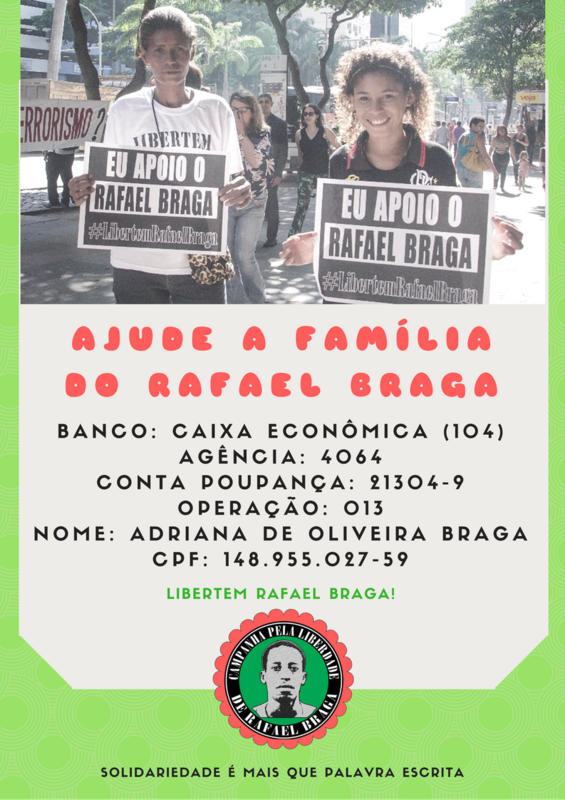 The Campaign for the Freedom of Rafael Braga makes a call for all collectives, movements and organizations that support Rafael’s freedom to join us in a series of mobilization activities. These activities will have the objectives of demanding the definitive freedom of our brother and also to gather funds for the crowdfunding that we are organizing for the purchase of a home for his family. Today, Rafael is serving time in house arrest so that he can treat tuberculosis which he catched while in prison. It’s running in justice an appeal in federal level against his absurd condemnation to 11 years for trafficking and traffic association. Rafael depends on the approval of this appeal so he doesn’t go back to prison in february 2018, when his treatment will be over. Therefore, we are making a call so that activities can be organized all over Brazil and abroad aiming to publicize the case of Rafael Braga and to debate themes like racism, genocide of Black people and people of color, mass incarceration, penal selectivity, prison abolition struggle etc. The activities can be cultural events, rallies, debates, paintings, stencil, propaganda, speeches and others. We ask for the groups and individuals that organize something to send us details about it through our facebook page or e-mail (libertemrafaelbraga@gmail.com). We also remind everyone the important goal of gathering funds to help the family to get a decent house. House arrest is still prison!